Subject:Provides information about the devastating waves called ‘tsunamis’ which can strike the Oregon coast and what action should be taken in case of such an occurrence. Devastating waves called ‘tsunamis’ can strike the Oregon coast at any time. These waves are caused by great undersea earthquakes that occur along the Cascadia Subduction Zone, one of the largest active faults in North America. Tsunamis are dangerous and destructive. 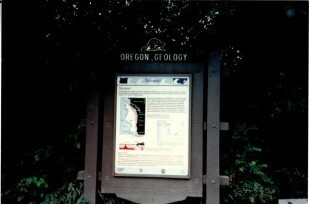 They have struck the Oregon coast at 200 to 600 year intervals. For example, about AD 1700, a tsunami caused by an earthquake on the Cascadia Subduction Zone flooded marshes landward of Yaquina Bay and other Oregon bays. Geologists know tsunamis have affected large areas in the past because tsunami-deposited sand has been found here and in other coastal lowlands in Oregon, Washington, British Columbia, and northernmost California. If there is an earthquake on the Cascadia Subduction Zone, Newport could be hit by a tsunami within minutes of the ground shaking. To escape a tsunami, you must respond immediately after feeling an earthquake – go to high ground and inland away from beaches, tidal channels, and other coastal lowlands. Remember, most tsunamis are not solitary giant waves; instead, many large waves may strike shore over the course of several hours. Do not return to the beach after the first tsunami wave. Wait for official word from authorities.